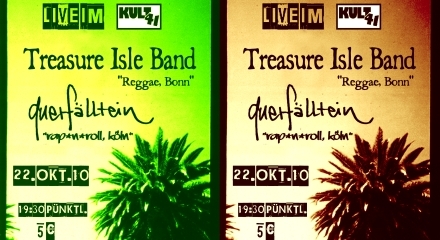 The concert series at the Kult 41 will be highlighted by one of the most serious live reggae acts in the region on the 22nd of october. 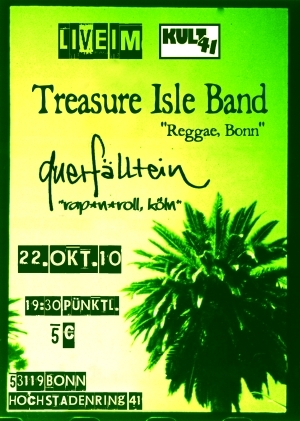 This time the Treasure Isle Band enters the stage to spread some crucial vibes. Concisting of nine musicians, the band’s musical core lies in the roots of reggae, playing and grooving in a classic style. The jamaican singer duo Out of Many, which joined the band in last october, persuades the audience with their well versed voices, whilst the musicians cook on high flame. The band will be accompanied by the rap’n’roll combo Querfälltein from Cologne, which is going to be th first act of the night. The concert starts at 19:30 sharp and is definitely worth 5€.